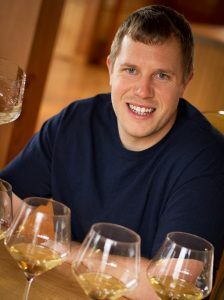 Here at the Maresh Red Barn Tasting Room, we are celebrating the great reviews we received from The Wine Advocate’s Neal Martin. 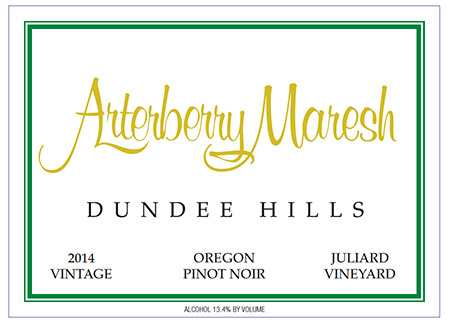 Reviewing 556 wines, Neil Martin, Oregon wine reviewer for Robert Parker’s The Wine Advocate, gave the top 95-point score to only one wine: Arterberry Maresh Maresh Vineyard Pinot noir 2014. He scored only eight wines 94 points, one of which was the 2005 Arterberry Maresh Maresh Vineyard Pinot noir. Arterberry Maresh Weber Vineyard Pinot noir 2014 received 93 points, Arterberry Maresh Juliard Vineyard Pinot noir 2014 received 92 points, Arterberry Maresh Dundee Hills Chardonnay 2014 received 91 points, and Arterberry Maresh Dundee Hills Pinot noir 2014 received 90 points. I sold off 40% of reds in 2013. It was an ugly vintage, he opined. Rot didn’t affect the whites but Weber and Juliard were declassified. So I asked Jim how he approached the 2014. In 2014 it cooled down towards the end of the season, so alcohol levels kept under control. I picked most of Maresh Vineyard between 8 and 11 October. I stopped experimenting with whole cluster and went back to basics in 2014. One hundred percent de-stemmed and a long time in old barrels. In 2014, one signature of the wines is the length. They finish so long, which is not normal for a warm vintage. I tend to oxidize hard after the press. How can I order your wine. I live. In Rock Springs, Wy. Long-time fan of Arterberry Maresh. Having a hard time finding a listing of available wines for purchase. I am interested in the 2014 and 2015 Pinot noirs. Any help would be appreciated.